Moscow, June 5, 2015. – "The Future of Private Philanthropy" expert panel took place at Moscow School of Management SKOLKOVO. SKOLKOVO Transformation Centre is launching this year’s study on philanthropy, dedicated to understanding the current state of the private giving landscape in Russia – from non-institutionalized to institutionalized practices – and its evolution in the future. 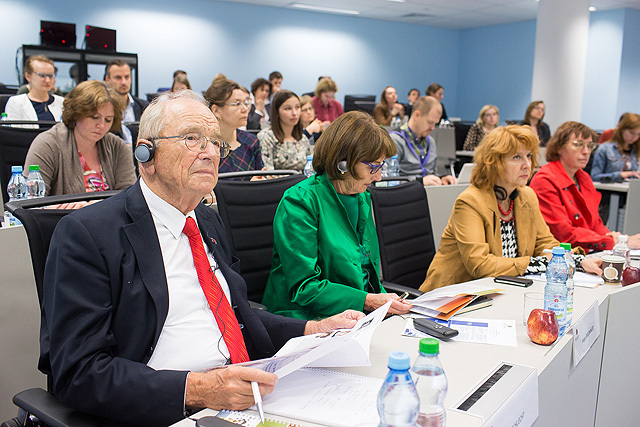 The expert panel has helped finalize the study agenda with contributions from international and Russian experts. The study will allow getting a general idea of the structure of private philanthropic foundations in Russia, its main mechanisms and barriers as well as future opportunities. Expert panel discussion was based on the research of several foundations and philanthropic organizations. Foreign panel experts were from America and Germany. Firstly, the private philanthropic foundation "Robert Bosch Foundation", whose representatives - Ingrid Hamm, Olaf Hahn and Atje Drexler, told guests about their many years of experience of maintaining the stability of the private fund. Secondly, there are founders of private charitable foundations – Helga Breuninger ("Breuninger Foundation") and Karl Schlecht ("Karl Schlecht Foundation"), who have a rich experience of effective work of the private philanthropic institution. And thirdly, Philipp Hёlscher, representing a German non-profit organization (“PHINEO”) that among its other areas of interest, measures the effectiveness of foundations. From the Russian side, Donor’s Forum Executive Secretary Natalya Kaminarskaya presented their annual report about the state and development of Russian foundations in 2014. The report contains statistical and analytical information about the activities of philanthropic foundations; there are trends and development forecasts of the institutional giving sector, and also the results of the year in the philanthropic field. The Vladimir Potanin Foundation presented their case study - "Building a Legacy of Leadership," developed by "Partners for Change", led by professor Gail Peterson from University of Oxford. Jim Litwin - Managing Director of “Partners for change” presented the case. The Potanin Foundation’s General Director, Oksana Oracheva, was part of the expert panel discussion on the topic of positive social change. The representatives of the Russian private foundations and other philanthropic organizations also attended the expert panel. The experts and guests of the panel discussed the effectiveness of private foundations as tools of charity, and the ways to maintain the stability and sustainability of the activities of charity funds. The expert panel discussion will allow SKOLKOVO Wealth Transformation Centre to launch its philanthropic study, having confirmed the agenda and the main directions of study. The study will focus on the preferred giving mechanisms of Russia’s HNWIs, their main barriers and will aim to forecast future trends. The study results will be presented in November 2015 at the annual "Wealth Knowledge Day" conference.